Set to go into production next month, two Chrysler Pacifica plug-in hybrids were spotted by AutoNews going through final testing and calibration checks in Detroit. Both of them, including the white Pacifica in the photo above, were roaming around in the Clawson, Michigan suburbs. 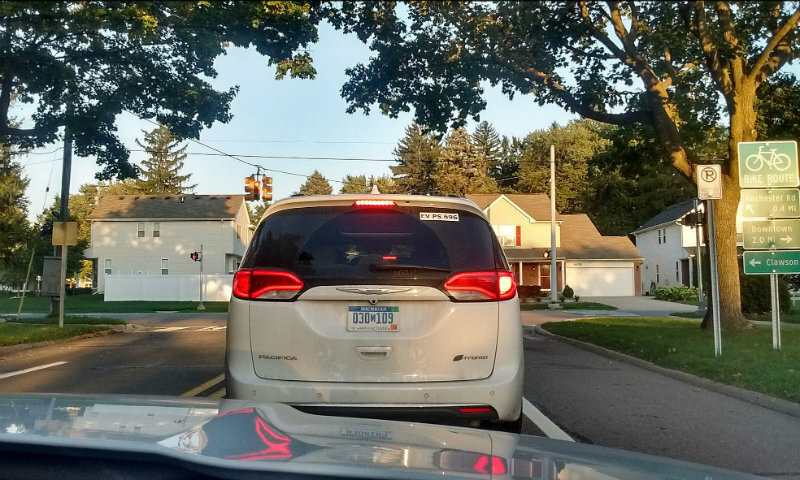 You wouldn’t know they were the hybrid variants if it wasn’t for their unique badges and the charging port found on the left side of the van. Powered by a 3.6-liter V-6 engine and two electric motors, the Pacifica Hybrid can deliver 248 horsepower and 230 pound-feet of torque. That should be plenty to haul the family around, but that’s not the best part. The highlight of the hybrid is its fuel economy as the van can travel 30 miles on a single charge and it’s estimated to get around 80 mpg-e in the city. Charging the battery should only take around 2 hours on a 240-volt plug and the battery pack is housed under the second-row floor so Stow 'N Go seating will not be available with the hybrid. Chrysler has not released the hybrid pricing yet, but it’ll most likely come at a premium. At least the hybrid qualifies for a $7,500 tax credit, meaning the monthly payments will be manageable even with a price premium. Interesting that one of the testers is white. I think the production hybrids will only be available in that baby blue color, at least for the 2017 MY. Hybrids, will be available in most if not in all colors. Teal Blue is only available on the Hybrid. Hybrids, will be available in most if not in all colors. That's good to know. Where did you find that info? the most to all colors from asking my dealer guy who places the orders. There was a PDF available on FCA's media site when the Pacifica and Pacifica Hybrid were first announced that listed the features that were planned for the hybrid. It seems that the entire PDF is too large for me to attach, but here's a screenshot of part of it. I tried to find the same PDF again on the FCA media site, but it appears to have been removed/replaced. Is that the only source of that info? I'm skeptical because none of the dealers that I have spoken to know anything about any options for things that they can't order yet. Ah, okay. That seems a little more concrete. Thanks!